It’s National Cheesecake Day!! This can only mean one thing…a cheesecake recipes! I have a really good one for you today! 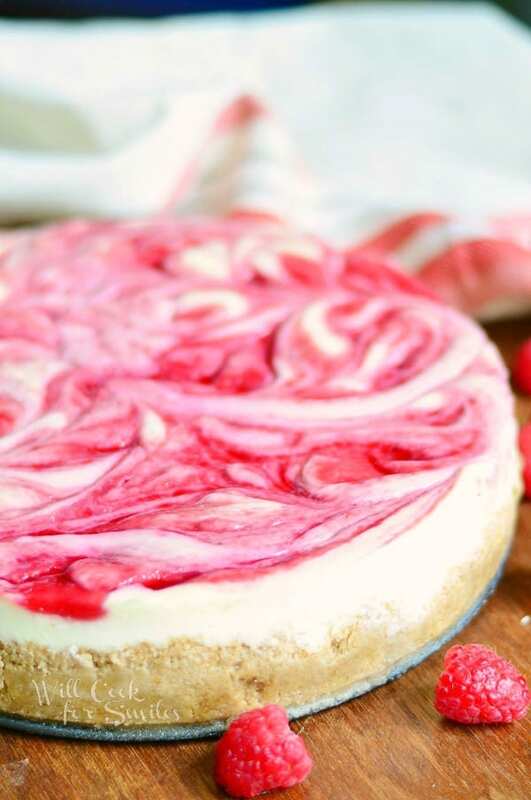 It’s a White Chocolate Raspberry Swirl Cheesecake, a soft and smooth cheesecake made with fresh raspberry swirl, layers of white chocolate on the bottom and on top. This is really an amazing treat for all of you! You are not just getting one cheesecake today. Nope! You are getting more than 65 cheesecake, all at once!! Some of the most talented food bloggers got together just to bring you this unbelievable cheesecake treat on this delicious day. If you are a cheesecake lover, like we all are, you will be overjoyed today! Can you believe it? 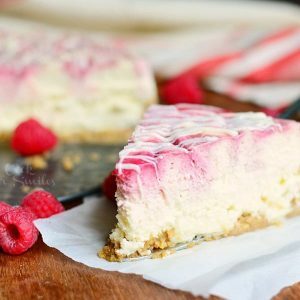 Over 65 cheesecake themed recipes! Wow!! When my good friend, Roxana from Roxana’s Homebaking (you need to check her out right now!) asked me to be a part of this fantastic celebration, I jumped for joy. Yay, I had a reason to make another cheesecake! Wait…I don’t NEED a reason to make another cheesecake, but I was happy to anyway. You already know how much I love making cheesecakes. I’m lucky enough that everyone in my family always wants a cheesecake for their birthday and I get to make lots of them. I love making (and eating) cheesecakes too and the more I get to experiment with flavors, the happier I get. I was pretty happy this week! This cheesecake turned out unbelievably good! White chocolate and raspberry is a classic flavor combination and you just can’t beat a classic. I haven’t made one this flavor before, so I knew I need to add it to my collection! I made raspberry topping with fresh raspberries and I would highly recommend it instead of using any kind of preserve. It might take a little extra time, but the fresh raspberry taste is so worth it! The cheesecake itself is so smooth, soft and light…ah, it’s pure heaven on a plate. Anyway, make it and you will see! 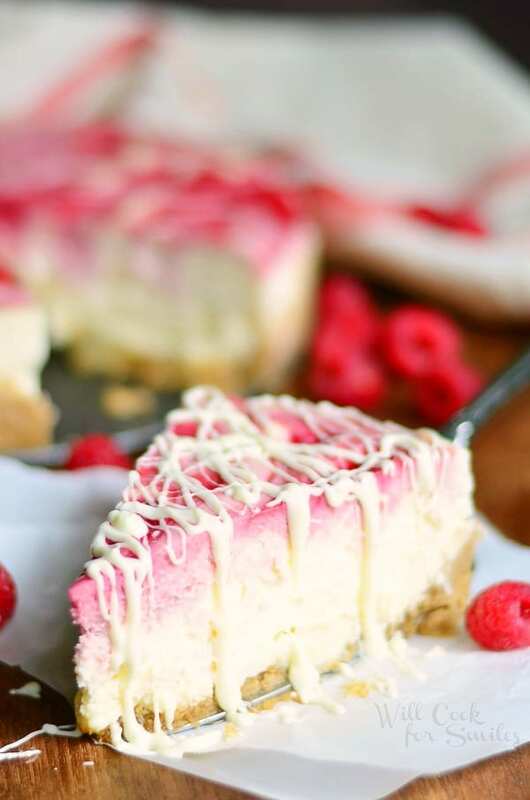 White Chocolate Raspberry Swirl Cheesecake, a soft and smooth cheesecake made with fresh raspberry swirl, layers of white chocolate on the bottom and on top. ~ Grease a 9-inch spring form and set it aside. Preheat the oven to 325. For crust: Mix the graham cracker crumbs, sugar, melted butter and vanilla. Stir very well, until all incorporated. Press graham cracker mixture into the pan, evenly, all over the bottom and about half way up the side. Break up the chocolate into small rectangles and layer them on top of crust, evenly all over the bottom. Start beating cream cheese and sugar on medium high speed until smooth, about 2 minutes. Add vanilla extract, and yogurt. Mix until combined. 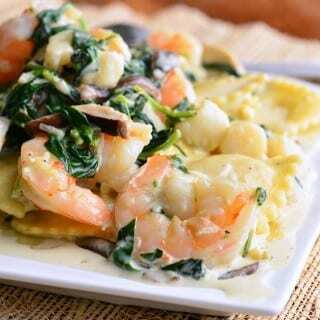 Add corn starch and while on medium low, pour in heavy cream. Mix until all combined, scrape the sides and bottom of the bowl and mix again. Pour the cheesecake batter into the spring form with crust. In a small sauce pot, over medium heat, combine raspberries, vanilla, lemon juice and sugar. 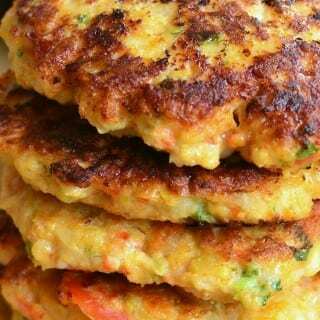 Mix well and cook, over medium heat and covered for about 10 minutes. Smash all the berries with a wooden spoon and cook for another 10 minutes on medium-low heat. Whisk in cornstarch and strain the mixture through a fine strainer to get rid of the seeds and leftover skin. The mixture should be thickened. Pour it slowly over the top of the cheesecake and carefully swirl it in to the cheesecake but don't mix. 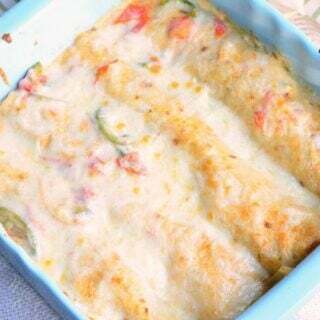 Place the spring form in the oven, inside a large roasting pan. Carefully add some hot water to the roasting pan, filling it about 1/2 of the way up the side of the spring form. Bake for 70-75 minutes. Sides of the cheesecake should be set but still a little jiggle in the center. 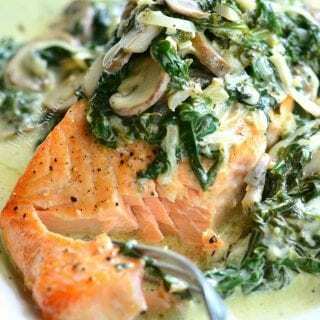 Let cook completely and refrigerate until ready to serve. Follow Lyuba @ Will Cook For Smiles’s board <>National Cheesecake Day<> (…Is Every Day) on Pinterest. Here are ALL the wonderful cheesecake themed treats!! My heard just skipped a beat when I saw this cheesecake! It’s almost too pretty to be eaten! Almost!! Love that you used fresh berries instead of preserve to make the swirl and the white chocolate drizzle, ah-mazing!! Thanks for joining us Lyuba! LOVE those gorgeous swirls Lyuba! This is what I had for my wedding cake! Love! Look at those swirls! Gorgeous! I LOVE white chocolate and raspberry! It is such a favorite flavor combo of mine too! I can’t wait to try this cheesecake, Lyuba! Pinned and sharing on FB! 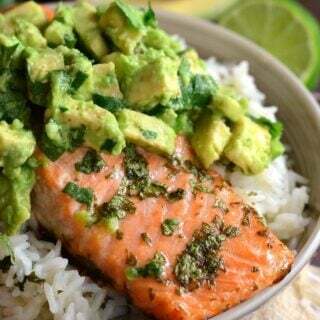 This sure is heaven on a plate! And so pretty – I love the pink swirls! 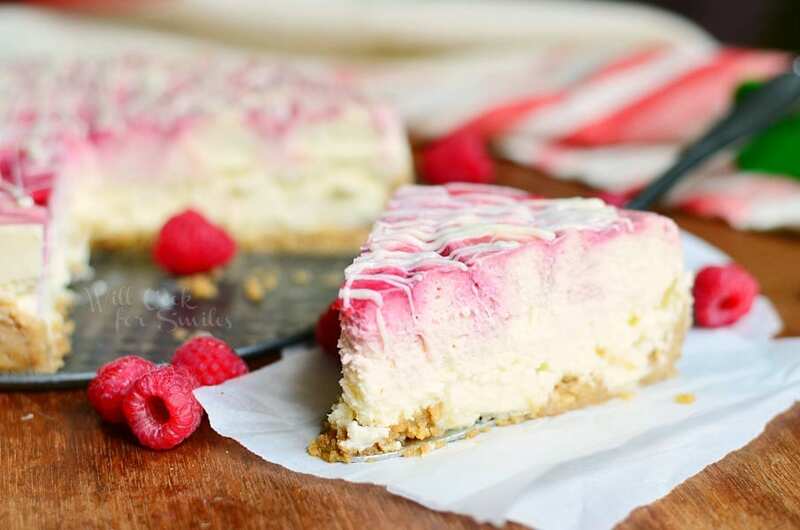 What a great cheesecake for summer. Happy Cheesecake Day! Will you teach me how to swirl? This is one gorgeous cheesecake…and I know it tastes darn good, too! I am totally requesting a cheesecake for my next birthday! I love that idea! Iyuba, I echo everyone’s comments – this cheesecake is so pretty! Those gorgeous swirls, that perfect light airy cheesecake, the fact that you layered a white chocolate bar on top of the crust before filling it – I love every element of this cake! And your photos are beautiful. That raspberry swirl looks amazing!! I do love me some white chocolate, yum! Your cheesecake is breath-taking. I love the flavor combination also!! So gorgeous!! My go-to slice of dessert at Burger King (of all places) was the raspberry swirl cheesecake–mind you, it was really good! So this is definitely a trip down memory lane. Love those swirls–I’ll have to make it myself soon now that I don’t frequent BK anymore! I just love those raspberry swirls! gorgeous! So disappointed… I dont know what i may have done wrong but this is almost a disaster. The crust was wet, even after being firmly pressed, and pre-baked. 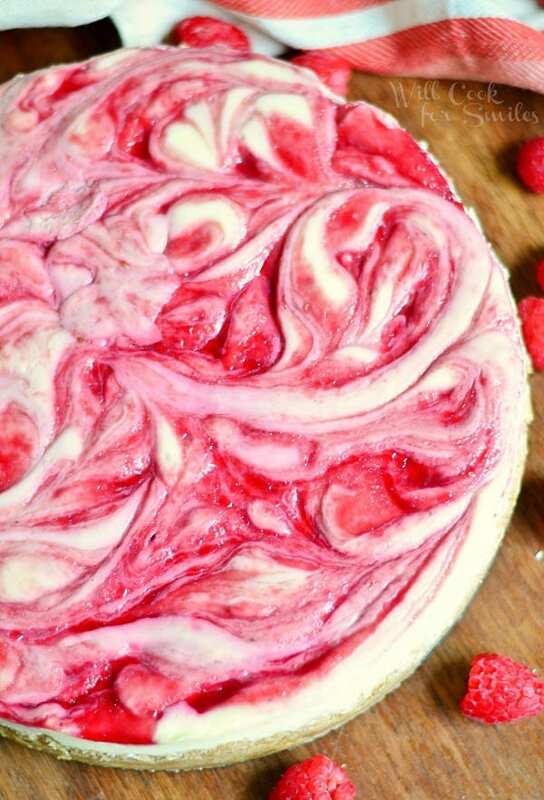 The raspberry swirl is browning, bubbling up, and nearly over my pan, but the cheesecake underneath is soup. 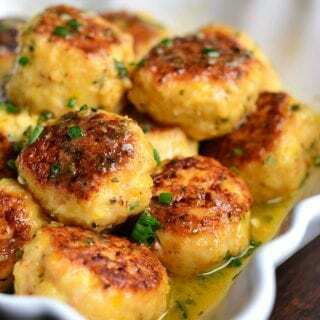 I followed all directions, used a Bain Marie, everything. I’ve had it in my oven now for nearly 2 hours and it’s still practically soup. Hoping another 20 minutes will show some improvements, otherwise my dessert is ruined. If it does improve, I’ll change my rating, but for now, sticking with a 2. Hi Eli! I’m so sorry it didn’t work out. I’m honestly not sure what went wrong. This is the cheesecake recipe that I use for majority of my cheesecakes. The crust may have been wet from the pan leaking. I’ve had a springform pan before that leaked some water inside. I wrap my pans in foil on the outside now but one still leaks in a little water. As far as cheesecake, I’m not sure why it would not be cooked after 2 hours. Was the raspberry jam thick enough and swirled rather than mixed in? Sorry, I’m just trying to think what could have gone wrong. I know it’s not your fault, as I’m sure your recipe works fine, I just felt that I had to point out my experience just in case. My pan didn’t leak, I tested it before I even put any filling in. I foiled it three times, and put some dry beans in the bottom to weigh it down in the larger pan, and it didn’t leak at all. The raspberry was thick, and strained through a fine mesh strainer, and it just would not set. 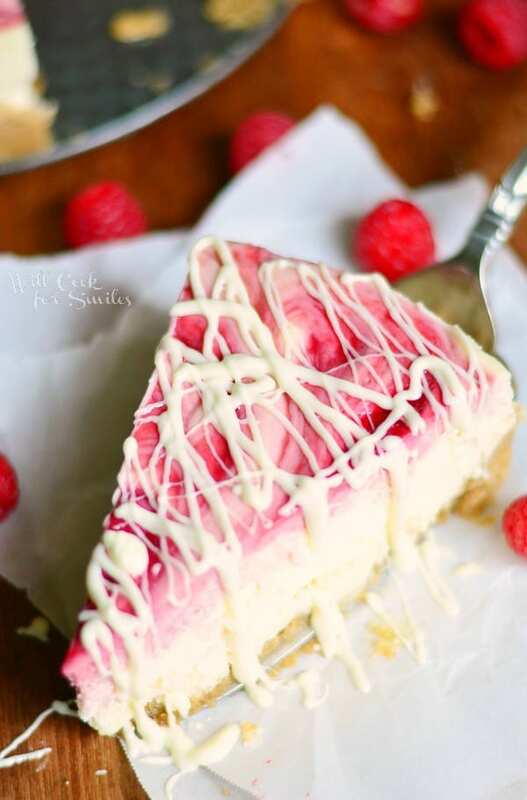 The raspberry was gently swirled on the top, I was able to lift it completely off the cheesecake and it had the consistency of scrambled eggs due to the longer cooking time. I took it out after the twenty minutes, and it poured out of the pan like water. I understand your questions and I’m glad you’re asking them as well, and I’ve asked multiple people who bake cheesecakes and they couldn’t even pinpoint what could have happened. It was crazy, and a lot upsetting. I may give this recipe another shot at a later date, but for now I just kind of chalked it up to horrible experience.